Are you shopping for a 2018 Hyundai Kona? Why don't you rather visit us at Spinelli Kia in Montreal and see all the advantages of the 2018 Kia Niro! 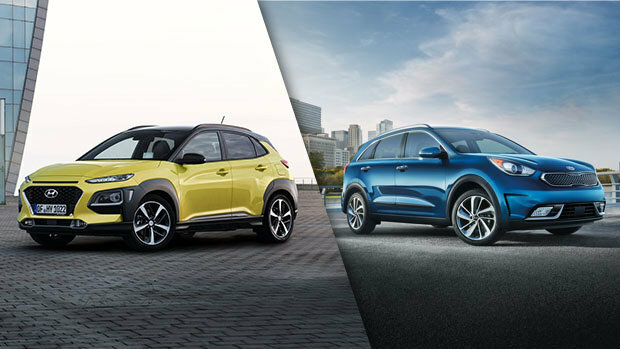 The brand-new 2018 Kia Niro, which you will be able to see more closely at Spinelli Kia in Montreal near DDO, is an exceptional vehicle in many aspects and it offers many more advantages than the competition, including the 2018 Hyundai Kona! Until you try it out at your Kia dealer in the West Island near Laval, here is a glimpse of its many qualities! This is a hybrid SUV. Unlike the 2018 Kona, which offers only 2 gasoline engines, the 2018 Niro has a 1.6-litre GDI four-cylinder engine paired with a synchronous permanent magnet electric motor and a lithium-ion battery. Not only will you have a net power of 139 horsepower, but your vehicle will also be exceptionally fuel efficient, with ratings of 4.6/5.1 L/100 km (city/highway), against ratings of 9.0/8.0 L/100 km for the Kona. You will be able to drive a 100% in electric mode. The 2018 Niro can at low speed only use the electric mode, which will allow you to save even more fuel. Do you need power? No worries: the 2 engines will work together for you to have optimal performance. Moreover, the Niro will be able to recharge its battery whenever you drive at a constant speed. Even if the Kona is a beautiful SUV, it cannot boast like the Niro to have received the iF Design Award in 2018! Its flowing but sturdy lines, its HID headlights, its beautiful rims as well as its famous “tiger nose” grille are surely an indication of this. Apple CarPlay/Google Android Auto compatibility, heated and ventilated front and rear seats, wireless charging for smart phone, a navigation system with an 8-inch screen, leather upholstery, a Harman/Kardon audio system and a push-button start are just some of the features you may find on board of your Niro, depending on the options you choose. As you can see, it has nothing to envy its rival at Hyundai! By choosing the 2018 Kia Niro, you could enjoy many advanced safety features, such as intelligent cruise control, rear cross-traffic alert, autonomous emergency braking, a rear-view camera, lane keeping assistance and so much more. In fact, the 2018 Niro has been awarded the Best Safety + Award by the IIHS. With so many strengths, it is no wonder that AJAC has named the 2018 Kia Niro the Green Vehicle of the Year! To learn more about the Niro, our current Kia promotions, or our different financing options, visit us as of today at Spinelli Kia! We are located in the West Island, not far from Montreal and Laval.